You'll see the A4 canvas background has been stencilled with lots of cogs - Super Thick Slap It On is ideal for this as it dries raised and solid, so perfect for adding layers of paint (and abuse in the form of sandpaper!) I also added a rough layer of Fine Modelling Paste to the frame before sticking it firmly to the canvas. Many, many layers of IndigoBlu Matte and Metallic paints followed until I got the look I was happy with. The central panel has a built up corrugated built up base showing glimpses of the deep base colours that underpin the paler and metallic layers on top. I also added a torn book page, altered with gesso, paint, heat embossed stamping and more of that cog stencilling. A little Rust alcohol ink across the canvas and frame helped to age it all and added lowlights to the spoon. That was wrapped with a combination of coloured burlap string and various wires to create a 'body', with the colours then echoed in the wings. Anyone who came along to the Make n Takes at Ally Pally will recognise the use of the Wild Butterflies stencil with Super Thick Slap It On and silver Luscious pigment powder. By using them on transparent modelling film I was able to add a mix of Raven Black IndigoBlu metallic paint and more of those Luscious pigment powders to get the perfect match of colours to the body binding on the reverse. To finish a scattering of old watch parts was used to enhance the design. Very cool! So many wonderful textures and layers! Fabulous. Love the colours and the wonderful texture you created around your fantastic butterfly. Now this is a stunner! Jenny. Just perfect imho - one I could admire over and over and never tire. The quote made me smile - I can relate lol . WOW! This is my new favorite Jenny masterpiece! WOW!!! Stunning! Love the background and fabulous frame. Just stunning Jenny, wow, amazing affects and I just adore what you did with that spoon! What a lucky find!! So lovely, love how you used the spoon. It is a great piece. I love this Jenny!! 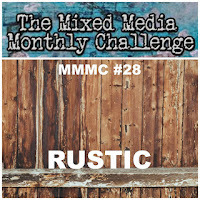 Thanks so much for linking up to the Mixed Media Monthly Challenge!! So gorgeous! All these textures and the contrasted colours! Fabulous! Beautiful texture and dimension on your awesome project. Glad you joined us at Creative Artiste Mixed Media Challenge. Oh, how delightful is this?!!! What a wonderful piece! Truly inspiring!!! 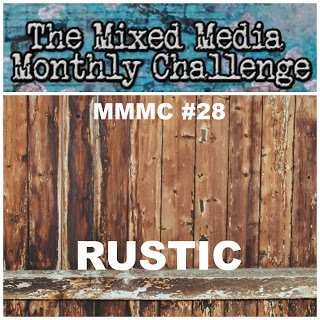 Thank you so much for sharing your beautiful work with us over at the Mixed Media Monthly Challenge blog for our Rustic challenge!!! Now this is Art!!! LOVE the use of the spoon with the butterfly! Just awesome! You rock Jenny!!! Absolutely brilliant, Jenny! Honestly I love everything about this make - every tiny bit! So cool! Thanks for sharing your fabulous steampunk project with us at SanDee&amelie's Steampunk Challenges! Wow Jenny, this is so stunning! I love everything about it, the textures, background, the spoon and the wonderful sentiment. Gorgeous!! Thank you so much for sharing with us at the Simon Says Stamp Monday Challenge Blog!! I had to come and check out the close-ups for all that fabulous texture and rusty drippage - truly brilliant.